This stainless steel cocoa shaker is a must have barista supply for any coffee shop wanting to add a special touch to their hot drinks. A sprinkle of cocoa is a professional way to add something a little extra to your beverages to make sure your customers return for their favourite drink. There are so many ways to use this shaker as it can be used for beverages such as cappuccinos, mochas, hot chocolates, drinks topped with whipped cream and much more. The premium stainless steel material allows this product to last through many uses in a busy business environment. With such frequent use in a cafe, it is vital to invest in a resilient material such as stainless steel. A chocolate duster is an easy way to breathe new life into your cafe menu and offer something different for loyal and new customers. This shaker isn’t limited to hot drinks, why not try it with some refreshing cold beverages? Chocolate milkshakes, Frappuccino’s and iced lattes with whipped cream are all great options for trying a topping of cocoa. 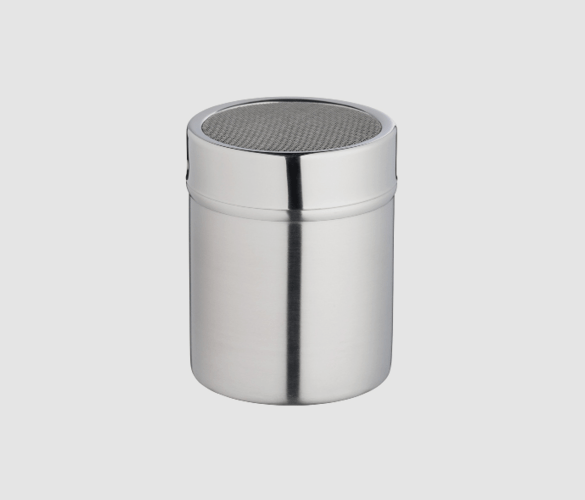 You can even use this shaker for sweet food treats such as pastries, muffins, cake and more. Ask your customers if they would like a complimentary dusting of cocoa on their morning pastry to give something extra with their coffee shop experience. The best aspect of investing in a cocoa shaker for your business is the versatility. Customer and baristas might surprise you with the wonderful creations and ideas they come up with for adding a dusting of chocolate. When purchasing food and drink equipment for your business, it is important to invest in materials that will last throughout the years to make sure it is worthwhile investment. It is also vital to find materials that have practical qualities as well as a professional appearance. Hygiene – It is incredibly easy to keep clean and hygienic. It doesn’t absorb food, drink or smells and can easily be disinfected. Heat resistant – Unlike cheaper materials such as plastic or nylon, it can withstand incredibly high temperatures without losing its shape or becoming damaged. Professional look – It is a material that looks professional in your business environment as it has a smooth, shiny and aesthetically pleasing finish. Rust resistant – There is no need to worry about this product coming into contact with moisture as it is rust resistant. Great value for money – It is a readily available product that offers fantastic value for money. The many benefits of stainless steel and the affordable price tag make it an obvious choice for most kitchens.